Our rafting trips are run from the weatherproof comfort of our native wood lodge in the village of Futaleufu where you will return each evening after the day’s adventure activities. You will sacrifice none of the comforts of home in this remote region of Patagonia, Chile. Experience the genuine culture of Chilean Patagonia from this spectacularly situated alpine village – a true cultural immersion experience awaits. Imagine Telluride Colorado one hundred years ago! Our multi-sport menu will allow you to customize your Chile rafting vacation and let you do the activities that you enjoy the most!!! This allows groups of different ability levels and interests to enjoy the same vacation. Our lodge based trips allow us to flexibly schedule our weeks. Our trips start Saturday-to-Saturday through Puerto Montt, Chile and Friday-to-Friday through Esquel, Argentina. Custom connections can also be arranged from San Carlos de Bariloche, Argentina to meet either a Friday or Saturday start date – call our office for that option. We guarantee departures on our Chile rafting Futaleufu Valley multisport trips! We won't cancel a trip at the last minute due to lack of sign-ups. We can also accommodate last minute bookings on many of our trips. If you are planning a trip in Chile that is not a guaranteed departure (participation dependent) keep Expediciones Chile in mind as a back-up – we might be able to save your vacation. We are one of the oldest expedition companies in the Futaleufu River Valley. Our professional river guides are well-trained in safety, first aid, and the knowledge of the river that our company has gained over the last two decades. What kind of guests go on your Patagonia rafting and multi-sport expeditions? Our guests come looking for an off the beaten path adventure and want to experience a spectacular untouched place that the normal travelers will never or rarely see and they enjoy the rewards of a challenge. They come from all over the world to visit us, but most often from: Europe, North America, New Zealand and Australia. I am traveling solo.... do people come by themselves on your trips? Our Chile rafting and multi-sport trips usually include an assortment of both single guests, couples, groups of friends and families. Trips with shared challenges bond quickly and you will quickly feel apart of the team. Before you know it you will be exchanging addresses at the end of the trip! How do you pronounce Expediciones Chile? and Futaleufu? The correct pronunciation is: "Ex-ped-ish-she-oh-nays". "Expediciones" is the Spanish version of the English word "Expeditions". In North America we are inclined pronounce "Chile" the the same way we pronounce "Chili" but the correct pronunciation is "She-lay". Futaleufu is pronounced: "Foo-tah-lay-oh-foo". Futaleufu is a Mapuche indian word meaning Big Big River - the two "fu"s, one at the beginning and one at the end, connote this meaning. What is the water temperature of the Futaleufu River? What is the weather like? The temperature of the Futaleufu River is moderated by the large lake, Lago Futalaufquen, whose surface waters serve as its headwaters. Even though the Futaleufu River Valley is surrounded by glaciers and snow capped mountains the waters of the Futaleufu river stay relatively warm coming from the sunny side of the Andes. The average temperature is between 16-22 C (60 – 72 F). More information about seasonal climate and temperatures can be found on our Patagonia Weather page. How are rapids classified on the Futaleufu? The international Scale of Whitewater Difficulty is what we use to classify our rapids. The spectrum of difficulty for rafting in Chile lies between the easy Class I and the extreme Class VI. How long is the Futaleufu River? The Futaleufu River is about 60 kilometers long, relatively short for a whitewater rafting river, but what it lacks in length it makes up for in intensity, size and action. Where is the departure point for your trips? Our Chile raft trips that run from Saturday to Saturday start in Puerto Montt, Chile and trips that run from Friday to Friday start in Esquel, Argentina. Custom connections can also be arranged from San Carlos de Bariloche, Argentina to meet either a Friday or Saturday trip date – call our office for that option. How many people fit in a raft? What kind of rafts do you use for rafting in Chile? Does each raft have a guide? Do I have to physically participate? We use top-of-the-line 18-foot Maravia brand self-bailing rafts for rafting on the Futaleufu river. These are of the Oar Rig - Paddle Boat configuration and hold a maximum of 9 people. One guide mans the oars with eight paddlers upfront. All rafts are equipped with grab lines and foot stirrups for your safety. We also have smaller 16 foot rafts. These are paddle boats which we use most often on the Rio Espolon, Rio Azul and other rivers on our Patagonia Safari Trips. Occasionally, in low water we will use these for Futaleufu River rafting. Every raft has a professional river guide in charge, serving as a boat captain. Because the Futaleufu is such a demanding river it requires that all paddlers be active participants. 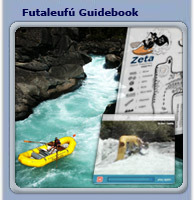 Do I have to raft all the class V sections of the Futaleufu? No. We leave our lodge each day to paddle a different section of the river. Early in the week we start with the easiest sections of the Futaleufu river and work our way up the harder sections. It is up to you to decide how much whitewater rafting in Chile you want to do during your week with us… each day we will have other equally spectacular multi-sport activities from which to choose. Do I need to have previous rafting experience? The Futaleufu river is recognized as one of the more challenging whitewater rafting rivers in the world. However, we have taken many people with no experience down the Class IV, Bridge-to-Bridge section one of the most action packed sections in the world and it gives you the experience of the Greatest Whitewater on Earth. Every guest, experienced rafter or newbie is exposed to our safety orientation, paddle training, and a swim test. If you are timid, and not comfortable swimming and you do not want more difficulty than the Bridge-to-Bridge, we do not recommend the optional Class 5 infierno section. It is easily walked around joining the rafts below and continuing on for more class 4 rafting. Will my Chile rafting trip be photographed? If more than two guests are interested in photos we will have photographer take photos of your raft trip which are available for purchase afterwards. Groups can also request a trip video to be made. If you are interested in photos or a video made of your Chile rafting vacation make a request when signing up. The dvd may be purchased after the trip. Do you carry radios or satellite phones? We carry two-way radios on all of our raft trips These radios are capable of calling our headquarters where changes in logistics or response to emergencies can be quickly handled. Do you drug test your guides and drivers? All guides and drivers are required to pass a pre-employment drug test as well as random tests throughout the summer. Futaleufu is in the mountains, is altitude an issue on your raft trips? Despite lying amidst the Andes Mountains the Futaleufu River lies in a deep valley that is only about 400 meters (1200 feet) above sea level. Is there an upper age limit to go rafting in Chile? No, the oldest we have taken is 78 years old and we will provide extra safety kayakers for seniors. The only age restrictions are on the younger end of the spectrum. We expect everyone to reasonably evaluate his or her fitness levels before taking a whitewater rafting trip of this magnitude. Is there a lower age limit for rafting on the Futaleufu? There is an age limit of six on the Rio Espolon and the lowest section of the Futaleufu above Lago Yelcho. Size, athletic ability, and swimming ability come into play on the other sections. We recommend 14 on the Bridge-to-Bridge section and 15 for Class V sections. Is there risk involved in rafting? Whitewater rafting, like all adventure activities, involves inherent risks. The hardest class V stretches of the Futaleufu are more challenging than commercially run trips in North America. Expediciones Chile does not assume liability for personal injuries or death. You will be asked to participate in our safety instructions and to read and sign an Assumption of Risk and Waiver Agreement prior to your trip. We cannot allow anyone impaired by drugs or alcohol to go on any of our Futaleufu river rafting trips. No refund will be made. Other Chile Rafting options include: Extreme Rafting in Chile, Four Day Futaleufu River Rafting, Patagonia Rafting Safaris, Rafting in Patagonia Challenge Week , Lodge based Futaleufu Rafting Trips. For more information see the Rafting Chile FAQs section. Adventure Travel in Patagonia, Chile Rafting & Argentina Rafting.Torres del Paine and FitzRoy trekking. Information about the the seasons weather and climate in Patagonia, Chile & Argentina..